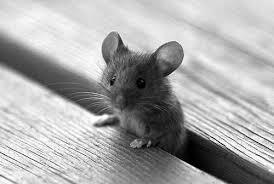 Whilst sitting in the saloon bar of a very ancient pub in the village of St Nicholas, Kent, England, with my brother Alf and our two wives several years ago, I spotted a tiny brown mouse emerging from a hole in the wainscot and scuttling around. I said, “A mouse” whilst lifting my feet from the floor. Everybody in that full bar with the exception of us four, left the room rapidly, and from that moment on I have been given the unfair reputation of being scared of mice. In an attempt to rid this image of cowardice of those lovable little creatures, I decided with poetic licence to turn myself into one, or at least be their public relations officer and write a poem about one of them. pulling faces in a gloat. not particular where to dine. and pull some awful faces. the ones he liked the best. and try to scare each guest. Although he’d lots of fun. with a most unchristian smile. there’s a halo above his face.